as you can tell by my most recent declutter challenge (the #minsgame i'm doing), i've definitely tried a lot of different systems of decluttering, with varying levels of success. i'm doing the misgame for the first round of clear outs, and then i'll look more closely at each item, like the konmari method. it's been quite a process downsizing over the years, but the less i have, the more i love it and the more i want to try more methods until i reach the point where i just don't want to declutter any more. but nothing has been as successful as getting rid of entire collections at once. yep, you heard me. 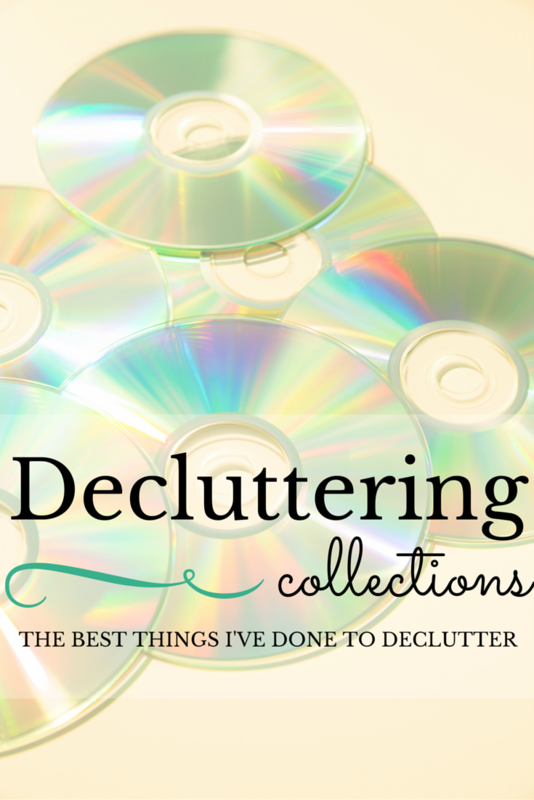 so, the best things i've done to declutter in my life? - gave up scrapbooking. it was so not for me, i'm way too much of a perfectionist. i like buying the pretty paper and cute stickers, but the love for the hobby stopped the minute i walked out of the store. i didn't like the actual putting together of books, so my stuff just sat in piles and grew. not fun. so i just quit. gave away every last piece of scrapbook material i owned. and i've never wanted to start again since. plus it keeps all those printed photos out of my house - i only print the ones i want to put in the (3) frames i have. blogging is a better, clutter-free hobby. - stopped collecting shot glasses. how many can you use anyway? i don't own any anymore. i used to pick one up every time i went on vacation and even had a few that friends brought back for me. and i never used them. i don't do shots. i have a hard line rule about it. (jello shots excluded, obvs.) no. shots. learned my lesson after the infamous 13 shots of jameson after the bar exam night. shots are the devil's work. - kept only my favorite hawkeye gear. i do love iowa apparel, (and this applies to cubs, bears, blackhawks and wildcats too) but i rarely have a reason to wear it. definitely not enough opportunities to justify keeping basically an entire wardrobe of it. so i kept only my most loved favorites. if i ever need to go all out on game day, i'll borrow from tara, who actually gets to wear such clothes at her university job, and thus has a huge collection. - got a library card. i do not own any books. i just check everything out at the library. sometimes i'll get some audible ones or e-books, but mostly i just use the library card. there's very very few books i've ever read more than once, and if i wanted to read any of them again, i'll just re-check them out. or buy the digital copy that'll i keep forever on a backup drive. now? now i just don't collect anything. (i hear you questioning my lipstick collection, betsy, i'm working on it!) i like it that way.